Perhaps the height of Wall Street&apos;s Alan Greenspan worship was reached with a 1998 article in The New Republic about a bond traders who actually created a shrine to Greenspan. "Dozens of news photographs of Greenspan adorn the walls; glass casing encloses two Bic pens Greenspan supposedly used in 1993," the article reported. "Quotations from more than 30 of his speeches are posted under a sign that reads &apos;Greenspan’s Teachings.&apos; The centerpiece is a red leather chair that sits in the middle of the room, surrounded by blue velvet ropes. A placard perched on the armrest says Greenspan sat in the chair in 1948—at the time, he was still in college. &apos;Some nights when we’ve lost money,&apos; trader Brent Donalds confides, &apos;I come in here and sit in the chair and think. It gives me inspiration.&apos;"
The problem is that the author of the article was Stephen Glass, and it was completely fabricated. The bond outfit described didn&apos;t exist outside his imagination. There was no red chair surrounded by blue velvet ropes. But Greenspan worship was at such a height at that point that people actually believed the story, or at least found it almost plausible for a while. 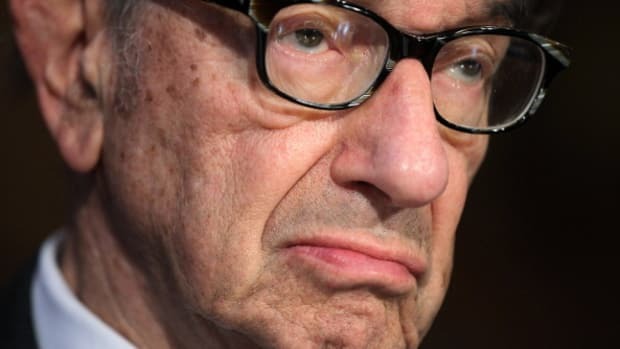 These days Greenspan&apos;s reputation is not what it was. But this morning the Financial Times reports that he still is held in high enough esteem by some financial players that he landed a job at Paulson & Co, the $28 billion hedge fund that famously profited by calling the crash of the subprime mortgage market. Paulson & Co will enjoy exclusive access among hedge funds to the advise of Greenspan. He also has advisory deals with Deutsche Bank and Pimco. We are kind of hoping they do give him a red leather chair from which to issue his advice.